There are two ways to say “I can’t wait” in Thai. I look forward to eating spicy and delicious Thai food. He looks forward to seeing his child. I am interested about speak thai language long time. And I can do it so so. But understanding thai people is not easy sometimes because they use different words sometimes. I found your lesson in youtube and I loved it. your pronounce is very clear and understandable. So, I will learn writing too soon. I hope. I just want to say thanks a lot for helping us. I just love your posts, there is always something useful and interesting there. I am married to a Thai, but we always speak English! I just came back from Thailand and really want to learn more. One thing I asked a couple of people and noone really could answer me. In Thai you write letter after letter in one sentence without separating words. How do I as a farang know when a word ends and another word starts? Sawatdee ka Udo, sorry for my late reply. 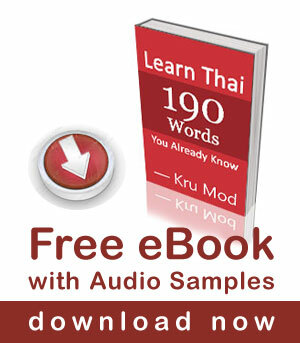 A Thai word consists of consonant + vowel , or consonant + vowel + final consonant (A tone mark os always on the top). The challenge is the vowels, it can be either at the front, on the top, below or surrounding a first consonant. Please pay attention to the vowel form and you can tell where a word starts or ends. For example; แม่ (mom) กิน (eat) ข้าว (rice) , we put three words in a sentence. แม่กินข้าว Can you see where the word “eat” starts and ends? I think I got it and will try to practice separating the words in a sentence.